This sophisticated appetizer is made from Bosc pears, double cream brie and flaky puff pastry. Preheat oven to 400. Roll out your defrosted puff pastry sheets onto a lightly floured surface. Cut each sheet into halves lengthwise and place onto a greased baking sheet. Take each pear half and cut them into very small slices. Try to keep them together as one solid half, and fan slices out. Move slices to the center of the tart. Overlap each slice of pear until the entire center of the puff pastry sheet is lined with pear. Roll up each edge of the puff pastry, then brush with egg wash. Sprinkle white sugar over pears. Place on centeer rack of oven and bake for 15-18 minutes until egdes are golden brown. Remove tarts from oven. Top with brie slices and allow to cool. Cut each tart into sections and place on serving plattter. 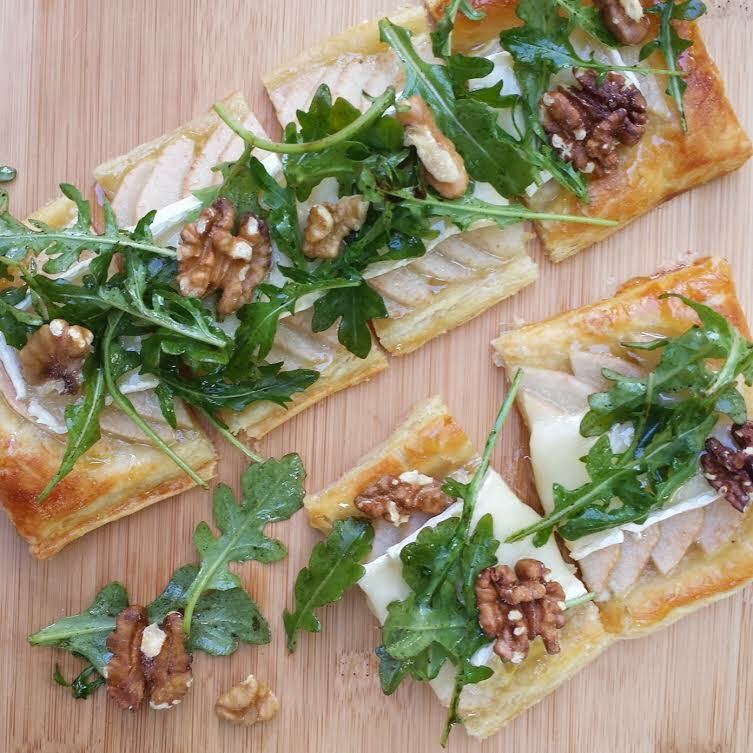 Dress arugula with baslamic dressing and place over each tart. Sprinkle with walnuts to finish. Do not overload pastry with pear as that will prevent the crust from cooking correctly. It was a late weeknight and I was craving something sweet. That's when I created these cobblers. I had blueberries and blackberries in the fridge and the cobbler recipe can be made with oly 4 ingredients. Try this cobbler cake with any other type of fruit or berry for a satisfying treat. Pre-heat oven to 375. 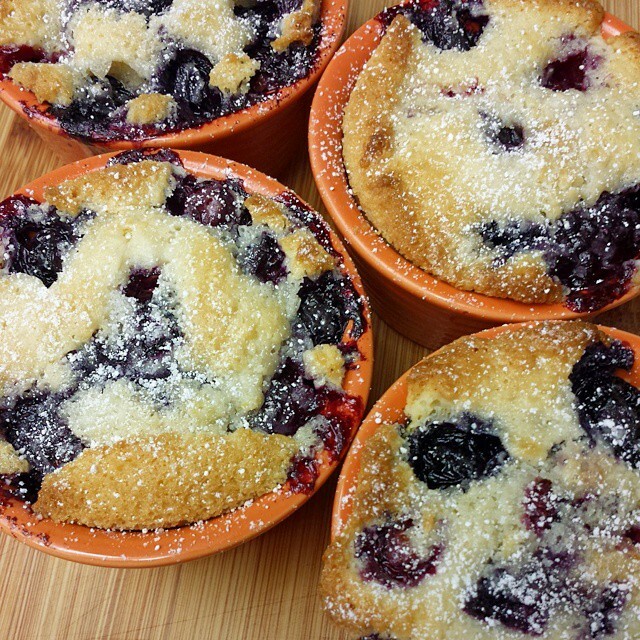 Take 8 individual oven-safe 3/4 cup ramekins and drop 1 Tablespoon butter into each ramekin. Place ramekins onto a large sheet tray and place in oven for 3-5 minutes until butter is melted. Remove ramkins from oven to cool. In a medium mixing bowl, mix blueberries and blackberries and with 2 Tablespoons sugar until thoroughly coated. In a large mixing bowl, whisk 1 cup flour, 1 cup sugar, baking powder, milk, lemon zest and vanilla extract until smooth batter forms. Next, distribute blueberries and blackberries evenly between the 8 ramekins. Pour your batter into each ramekin over the berries. Fille each ramekin with batter until it is a little over 3/4 of the way full. 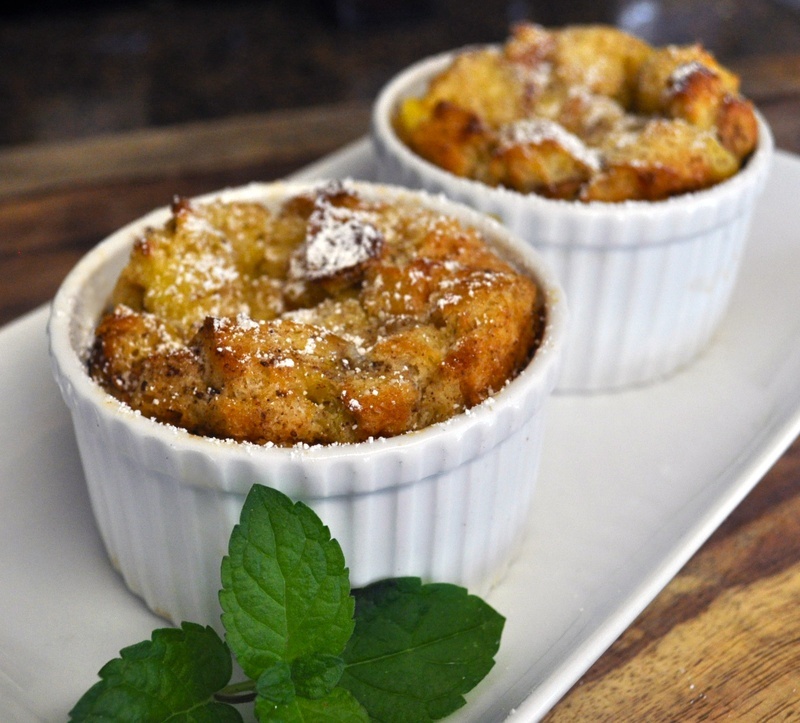 Place ramekins on a sheet tray in the oven and bake for 30-35 minutes until the top of eachcobbler is golden brown. Remove cobblers from oven and allow to cool for 5 minutes. Top with ice cream, powdered sugar and whipped cream. 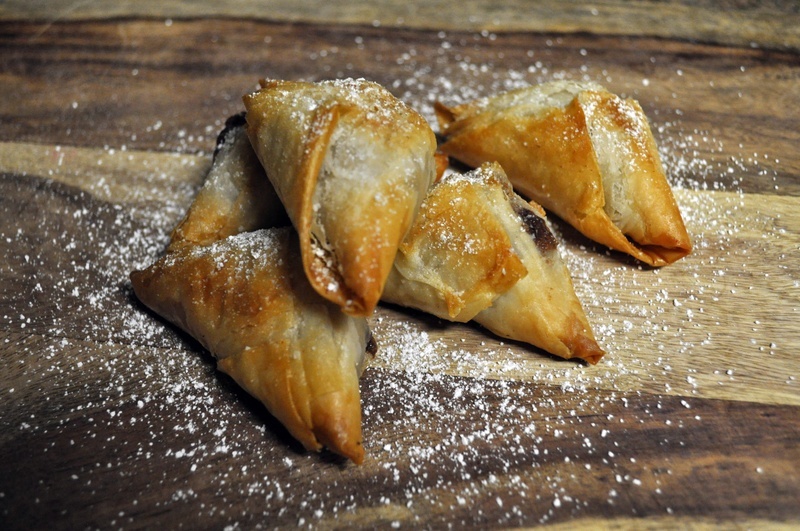 These Green Apple Phyllo Turnovers are a great last minute dessert idea for the holidays! You can prepare them ahead of time and bake, or bake ahead of time and serve at room temperature! Pre-heat oven to 375. Heat large sauté pan over medium-high heat. Add 3 tablespoons butter to pan and heat until melted. Add apples to pan with lemon juice, cinnamon and nutmeg. Saute until soft. Remove Phyllo sheets from package, always keep a moist paper towel over sheets as they dry out very quickly, and pick out one sheet. Lay on a flat surface and brush with melted butter. Fold sheet in half vertically, brush with butter again and fold once more until you have a long rectangular strip. Add a small amount (1 tablespoon) of apple filling to bottom edge, then roll up into the form of a triangle, just as you would fold a flag. Brush the outside of the turnover with butter and place on cookie sheet. Bake for 10 minutes, then flip over for the remaining 5. Bake until golden brown and keep an eye on them as they can burn quickly. Let cool and dust with confectioner’s sugar to garnish and enjoy! Celebrate Hanukkah and Thanksgiving falling on the same days this year with a dessert that combines the two: Challah Bread Pudding! Challah bread works perfect in bread pudding because it is high in egg. The result is a slightly rich pudding that can be eaten for dessert, or breakfast! This dessert is actually fairly easy, and can be made with ingredients you already have in your pantry and fridge. *Tip: You can also add raisins, cranberries or other dried fruit into your pudding. Just add 1/2 cup to every 3 cups of bread. You can cook this pudding in one of two vessels: A small 8 inch baking pan, or four individual 4 inch ramekins. I chose ramekins for my bread pudding because they look nice, and it gives everyone a nice individual portion. Pre-heat your oven to 350. Grease your pan or ramekins with cold butter. Add the challah bread into your pan. Drizzle melted butter evenly over the bread until thoroughly soaked. Make your egg mixture. Mix eggs, milk, sugar, vanila, cinnamon and nutmeg together with a whisk until incorporated. Then slowly and evenly pour mixture over your bread. lightly tap with a fork until mixture is soaked into your bread. Pop into the oven for 45 minutes for an 8-inch pan, or 25 minutes for ramekins. Lastly, take a fine mesh strainer and place powdered sugar into it, lightly dust over bread pudding for garnish. This pudding goes PERFECT with a chantilly whipped cream, or vanilla ice cream. Enjoy! 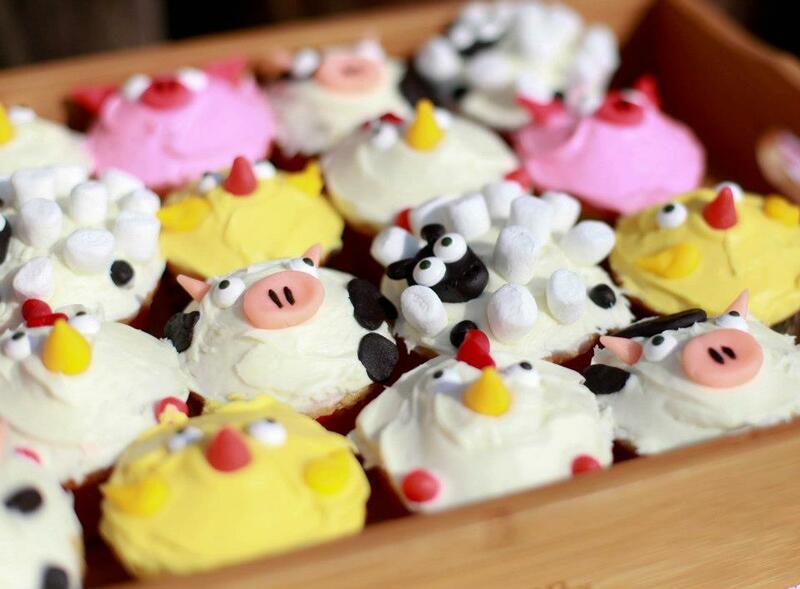 Check out these barnyard cupcakes I made last weekend. How cute are they? I made them for a toddler's birthday at a local farm. They look like they would take a long time to make, but this isn't the case. I made all the fondant pieces the night before and kept them wrapped them loosely in saran wrap. The next day, I baked and iced my cupcakes and then topped them with their beaks, eyes etc. These days cake decorating is so popular that you can often find already colored and packaged fondant. But, you can always do it the old fashioned way by dying it yourself. 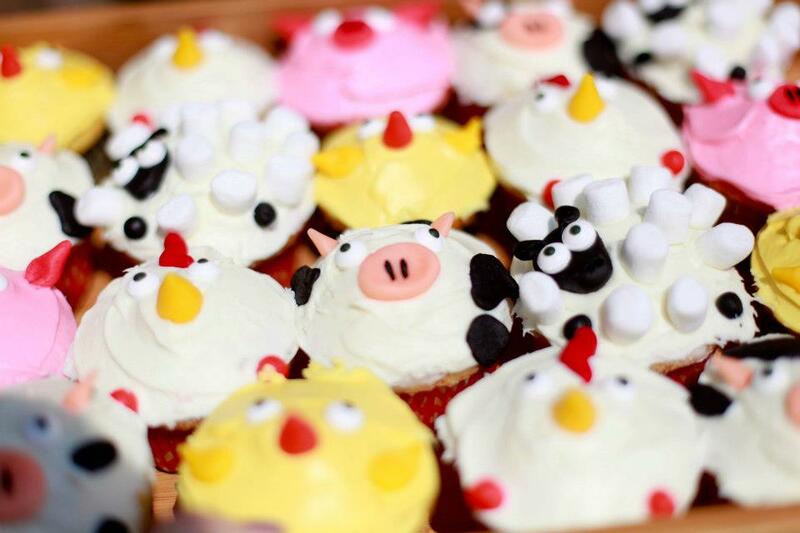 I made three different kinds: Lemon (Baby Chicks), Strawberry (Pigs) and Vanilla (Sheep, Cow, Chicken). I finished the sheep with mini marshmellows to look like wool.